The Catholic Jedi Academy: Pope Benedict XVI's Resignation: "But No Less With Prayer And Suffering"
Pope Benedict XVI's Resignation: "But No Less With Prayer And Suffering"
"After having repeatedly examined my conscience before God, I have come to the certainty that my strengths, due to an advanced age, are no longer suited to an adequate exercise of the Petrine ministry. I am well aware that this ministry, due to its essential spiritual nature, must be carried out not only with words and deeds, but no less with prayer and suffering. 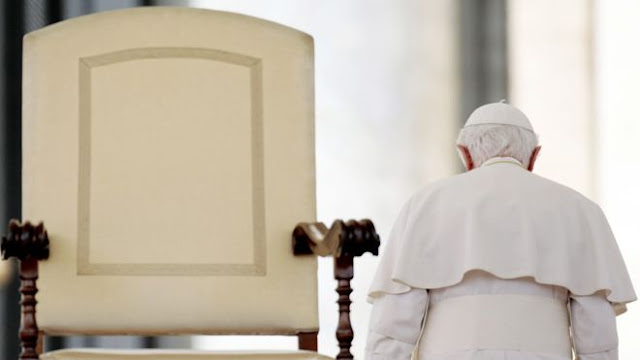 "However, in today’s world, subject to so many rapid changes and shaken by questions of deep relevance for the life of faith, in order to govern the bark of Saint Peter and proclaim the Gospel, both strength of mind and body are necessary, strength which in the last few months, has deteriorated in me to the extent that I have had to recognize my incapacity to adequately fulfill the ministry entrusted to me." Of the many obligations and realities which come with being a Pope, the Successor of Saint Peter, I would imagine that many people never consider the sufferings which come with fulfilling that ministry as Pontifex (Latin for “bridge builder”), the man who must bridge the gaps and maintain the connections to all people in God's holy Church and to all people in the world. Constant and unrelenting pressure: Meetings. Audiences. Knowing and speaking several languages. Traveling the world. Preparing speeches, homilies and communiques the whole world will hear or read. Having little privacy amid the settled and self-propelled hustle and centuries-old habits of the Papal household. Fatigue. Stress. Sleepless nights. Medical and health problems. Fear: Fear of failing the Lord. Fear of damaging the unity of the Church. Fear of your personal sinfulness and character defects being used by the Devil to trip you up. Loneliness: like the Lord Jesus' agony as he prayed alone in the garden of Gethsemane. The unique isolation of being the man chosen by Christ to carry, literally, the weight of the world in your heart and mind. The unfulfilled disappointment you feel when you recall your hopes of where you thought you would be and what you hoped you would be doing when you reached retirement age. A younger man fulfills this vocation with difficulty. An 85-year-old man must suffer greatly when he realizes that he is not satisfactorily fulfilling his role, and will not be able to continue because of physical weakness and deteriorating health. A decision to resign for the good of the Church took great humility and great courage. I have placed great confidence in the words and deeds of this man, Josef Ratzinger, our Holy Father, Pope Benedict XVI. I have found it easy to trust him and to support him. And I can only admire him for his honesty and humility. And I am, selfishly, weeping a little, because I want more of his tenure, more of his wisdom, more of his grandfatherly encouragement. When I was studying in Rome 33-years-ago, many mornings, while walking to classes at the Gregorian University, my classmates and I would see Cardinal Josef Ratzinger passing through Saint Peter's Square at a distance, near the Colonnade, as he walked to his office. We would wave, and shout "Buongiorno! (good morning)" And he would wave back and also wish us a "buongiorno." Now, 33-years-later, you and I see him as Pope Benedict XVI passing through Saint Peter's Square, waving to us at a distance as he passes through, and leaving us with his assurances that he has done his best, and that Our Lord Jesus will take care of everything.